* Using number lines - to assist with counting, estimation and understanding gaps between numbers. Number lines are also a good model to show addition and subtraction (we have just begun to experiment with their use in understanding the calculation strategy Friendly Chunks. In the first place we are looking at friendly jumps. How many jumps on the number line from 6 would you need to reach the next friendly number 10 (work with higher numbers fro more able)? *There are still some Yr 2 children who need ongoing practise with forwards and backwards counting starting at any number and beyond 100. This shows they are yet to fully understand the repeating patterns of numbers into the hundreds. Please practise with Guess and Press with a calculator. e.g. enter 76 +3 Then write what you think the next number will be. Press = and check and so on. Can be done with 3 digit, 4 digit and even numbers with more digits. * FRIENDLY PAIRS - Does your child know all the pairs of number that add up to ten? Given a number, can they tell you the friendly pair? Practice with games under Useful Websites 2018. * FRIENDLY AND FIX - Does your child know how useful knowing add ten is? Place value understandings develop over time, in a range of contexts and with ongoing practice. In the first place the experiences should be with concrete materials, followed by diagrams, followed by mentally visualising. understand the place the digit is standing, in the number, affects the value. the 2 in 243 represents 200 etc. The ability to see numbers without counting all is an important pre-requisite for fluency with mental computation skills (which some Yr 1’s are ready for and which is a requirement for Yr 2). The purpose if this information under the Maths What Are We Learning tab is to provide 'at year level' information and it is especially useful if your child is having difficulty with increased expectations. If your child is performing well, extension is provided but will not be outlined here. 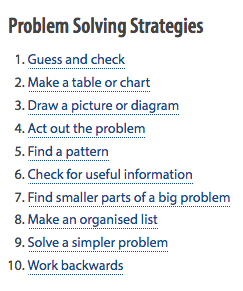 In Term 1 Mrs Gartner will be introducing the ten problem solving strategies. These strategies are the same for both Yr 1 and Yr 2. These strategies will be introduced to the group and then children will apply them to contexts that are appropriate to their abilities. A key part of the learning is to develop appropriate language so conversations around how to solve problems can be understood by all. See below for the strategies. All year we will work towards developing an awareness of various computation strategies and being able to verbalise a range of ways computations can be made. We also identify when some strategies are more effective than others. The language used in these conversations needs to be common so children can understand each others' explanations. Mental computation strategies to learn this year if not already known. * Activities to ensure children count and write numbers correctly to 100 (Yr1) and to 1000 (Yr 2 -currently revising understandings to 100). (Common errors at this age - writing 704 for 74 or for Yr 2's 4006 for 406) You might like to check if your child is doing this. * Using one hundred grids - can you work out where the number would be on a blank grid, ordering numbers according to size etc. 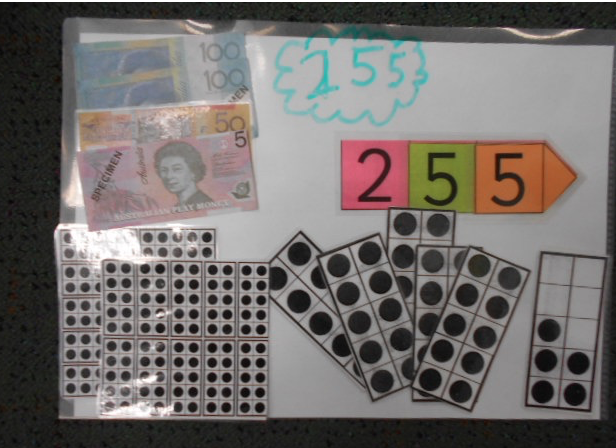 To practice at home Yr 1's and some Yr 2's (if place value not well established.) play games where numbers are bundled into tens e.g. roll dice... collect straws and make a bundle of ten whenever you have enough straws. Once you have ten bundles of 10 or ten 10's we know we have one hundred.